I am making cards for my stash and am making up card kits from past classes. This one is from my May class which featured sanded white core backgrounds and fun image which created cards without greetings which are more versatile as they can suit more than one occasion. This card features a laser printed digital image form Pixabay - Artsy Bee of a stack of coffee cups. I love the colour on these cups!!! 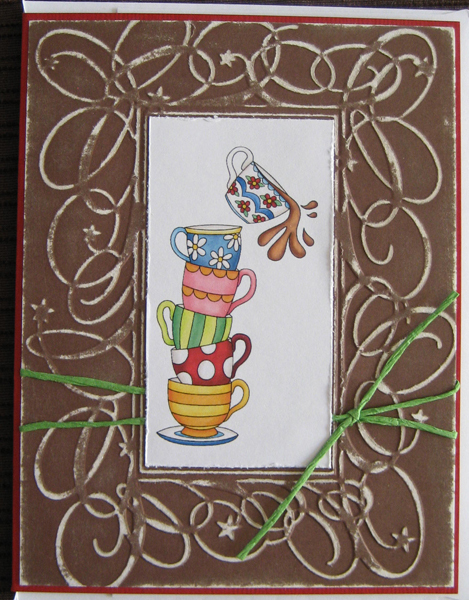 I started with a red card front and sanded the embossed background to reveal the white core of the cardstock. 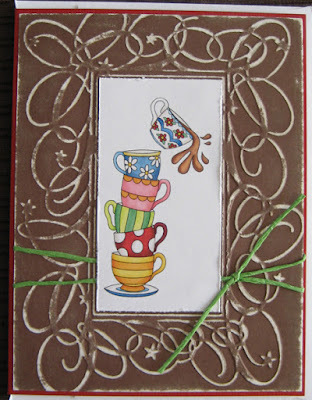 This leaves a very velvety smoothness which adds texture to the card. I tied the green raffia around the background before adhering it to my card. I used my distressing tool around the edge of the cup image and mounted it over the frame in the embossed design using 3D foam tape. This was a really quick one! Love having kits on hand for getting cards made fast! !